Judy and Pat presented at the GFWC California state conference in San Jose on Saturday May 14th. Approximately 40 representatives attended the hour long heifer workshop. The GFWC members explored world hunger through the "What's for dinner?" activity. After this activity the participants learned how Heifer International is working to overcome world hunger and poverty. Heifer brochures and educational materials were disributed and participants brainstormed fundraising ideas they could use with their clubs. The workshop was enthusisstically received by all in attendance. 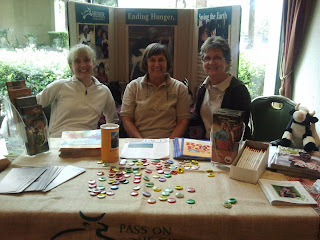 Amy handed out materials and answered questions at a Heifer information table throughout the day. 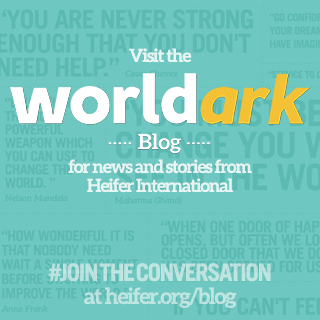 More than 200 woman were at the conference and many of them stopped by the table to share Heifer stories, learn about Heifer's mission, and collect materials and ideas to share with their club members back home. Overall it was a successful day and we are looking forward to working with the GFWC in the coming months. Heifer International volunteers Pat and Suzanne spent a fun filled afternoon talking with college students at Sac City College as part of their Earth Day celebrations on April 26, 2011.